It’s easy to assume that once you have stood on the summit of Everest, the world laid out before you, that no other climb will offer quite the same challenge. However, hanging from ropes on the icy face of Aconcagua’s glacier in South America, their bodies shuddering uncontrollably with cold, their fingers at risk of frostbite, Jayanthi Kuru-Utumpala and Johann Peries would have been the first to point out that that assumption was wrong. Just 500m from the summit of Aconcagua, but still hours away in reality, the two Sri Lankan mountaineers chose to head back down. They had landed in Mendoza in north-central Argentina, and began their journey from there toward the mountain on February 6. Their first sight of Aconcagua came across a broad, flat plain, which ended abruptly as the mountains rose in sharp relief. The summit itself, framed between the slopes of other mountains, was visible in the distance. Johann felt his heart surge: “It’s hard to describe the feeling of seeing the mountain for the first time. You’ve pored over all these images and planned, and then there it is. It’s like nothing else in the world,” he remembers. They are famous for having become the only Sri Lankans to summit Mt. Everest – Jayanthi in 2016, and Johann in 2018. They’ve become national heroes as a result, even as they have continued their everyday lives – Jayanthi as a leading women’s rights and gender expert and Johann as an entrepreneur and one of the city’s best known stylists. 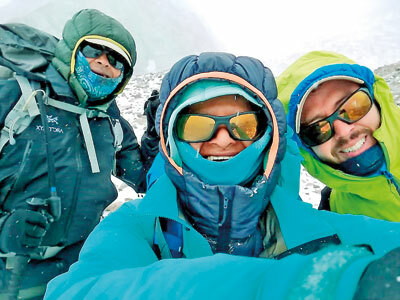 The two, who hope to complete the seven summits challenge by standing on the peaks of the tallest mountains on every continent, have had people rooting for them. This time, their Summit sponsor was Hatton National Bank while their Official Gear sponsors were Petzl& SEALs. Wurth Lanka also partnered with them. 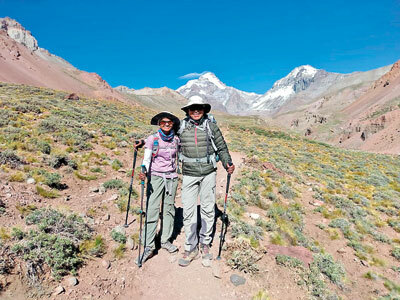 Now, the duo say there were many similarities in the terrain between the approach to Aconcagua and that to Everest. A three-day hike had taken them first along the Vacas River, and then up the Relinchos. They could make out the Polish Glacier even from this distance – a smear of white at the highest peak, wreathed in cloud. Each water crossing brought them closer to their destination but required that they mount one of the expedition’s faithful mules or simply brave the frigid waters with their pants rolled up. More often than not, they opted for the mules. With a few days rest in Mendoza to draw on, both Johann and Jayanthi were in fine form in the days leading up the climb. Some of this ease extended to their hike up to base camp and Plaza Argentina (at 13,780 feet) itself, where in a first for them, they were served wine and enjoyed a BBQ at the foot of a mountain. They offer these mouth-watering feasts as an explanation for why Johann lost 10kg after Everest but only 2kg after Aconcagua. The hardest challenges now lay ahead. The two were among only four people attempting the summit through this technically challenging route this year. Their guide had impressed upon them how the success rates were lower for those who opted for it, adding that in any case, they would only reach the summit if the mountain willed it. Jayanthi was completely accepting of this philosophy. “The summit can be quite elusive. There are so many things that have to come together, that there is really no way of predicting what will happen,” she says, adding that it has always felt true to her that the mountain chooses you, rather than the other way around. They began their rotations, carrying their food up to Camp 1 (15,400 feet) and then later to Camp 2 (19,300 feet) and down again; making the journey multiple times to help them acclimatize. On one of those rounds, a storm hit, and in those winds Jayanthi says she was actually afraid. Winds rushing off the Pacific Ocean were pouring down these slopes at 75km to 80km per hour, and these threatened to lift her off her feet and send her tumbling down the slope. “I found it really tough,” she says, adding that a backpack filled with 10kg of food added to the challenge. Johann had experienced similar winds on Everest, but had not been trapped outdoors like they were here. They could barely see, and had to watch for small ice and scree propelled by gusts. They made it through, and the following days brought stunning views. The horizon was so clear they thought they could see all the way across the Chilean border, and the ranges lay stretched out before them, great masses of rock and snow piercing the sky. With so few people on the route, it felt like they were truly out in the wild. Rearing above their small tents at Camp 2, the Polish Glacier was a steep, icy incline and an intimidating presence. 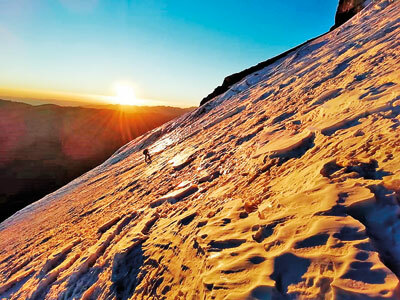 Before attempting that final stretch on February 18, a 10 to 12-hour roundtrip to the summit, they were tested for their fitness, the ability to self-arrest and climb at speed across snow and ice, as well as their understanding of essential techniques like the running belay system. Having passed, they set off at 2 a.m. Very quickly the two realised that they would have benefitted from more practice with the ice axes on a steep surface. They needed to be able to work with two ice axes for long periods of time, and this tested their strength and skills. “The technique we had to use here was completely different to what we had used on Everest,” says Jayanthi adding that they progressed at a much slower pace as a result. They describe a climb so steep, that one can barely rest, standing upright even when on a break, wedged into the ice in an attempt to stay anchored. “It was very cold, and very clear, with the wind coming off the glacier,” Jayanthi remembers, adding that it was a challenge to keep up with their more experienced guide. After several hours, dawn tinged the horizon with colour, but it remained bitterly cold. Their guide advised them to turn back, pointing out that there were several hours yet to go, and then they would still have to face the return journey. The two were shivering so much that they knew hypothermia was a real risk. The equipment had to be handled without heavy gloves, and that left their fingers miserably cold as well. The decision was taken to head back. Johann says he turned in part because of a miscommunication that had them believing they would still be able to attempt the less technical route. Unfortunately, the logistics weren’t in place for that. The duo says they were disappointed but do not regret their attempt. Aconcagua will be waiting for them when they return another day.